I recently discovered an idyllic hotel and it is too good not to share. Calistoga Ranch, nestled in a canyon in Napa Valley, delivers rustic luxury at its finest. It feels like a world away, but in reality you are less than 2 hours from San Francisco. North of Yountville and St Helena, it’s a lovely destination for escaping some of the busier parts of Napa. Upon arriving you are whisked away in a golf cart to settle in to your room. The rooms are all built around outdoor spaces. Our room - on the creek side (highly recommend over forest for the privacy and more immersion in nature, we could hear the river running from the bed) - was two spaces separated by a large wooden deck. One room had the bed and a large bathroom, the other was where you’d hang out with the couch, coffee table, kitchenette, desk and half bathroom. A unique set up for sure, but it was refreshing to spend so much time outside - even though one of the days we were there was super rainy! There are lots of special touches around the hotel - a glass of local wine upon check in, a on-site chicken coop and pen with two baby goats for the kids to check out. The pool is beautiful, set on a large grassy knoll, with views of the surrounding woods. We didn’t spend much time there due to the rain, and having a one year old! But would love to go back and enjoy that beautiful space. The on-site restaurant The Lakehouse is reserved for guests of the hotel, so it felt very quiet and intimate, but the food was outstanding. It’s set all the way at the top of the property - up a big hill. If the weather permits, definitely sit outside on the deck and enjoy the view of the lake. We ate there both nights. Last but not least, the spa is worth a mention. The Calistoga area is known for healing mineral waters, and the spa has several soaking pools of different temperatures for guests to soak them in. I indulged in a fantastic massage that was equal parts relaxing and therapeutic. Details… 2 hours north of San Francisco, this intimate property boasts 50 freestanding lodges immersed in nature. Outdoor showers, gas fireplaces and private hot tubs are a few of the many amenities. The highly attentive staff delivered impressive service and will accommodate any need. Pack… A swimsuit for soaking in the mineral waters or relaxing by the pool. Plan Ahead… Book a massage and spend some time at the spa to take advantage of the mineral waters. Day Trip… Explore the small, charming towns of Napa Valley. In St. Helena, try a breakfast sandwiches on the famous English Muffins at Model Bakery, lunch at Farmstead at Long Meadow Ranch or burgers at Gott’s. Further south, check out La Calenda, the newly opened Mexican restaurant from Thomas Keller (of French Laundry fame), the always indulgent Bouchon Bakery or one of my all time favorites Ad Hoc for a delicious family style meal. I love a good weekend getaway and Palm Springs never disappoints. It used to be a weekend escape for movie stars from LA, now it’s known for its mid-century modern architecture, music festivals and trendy hotels. A few of my favorite stops on this trip: brunch at Norma’s at the Parker Palm Springs, drinks at the Ace Hotel pool, more brunch at Cheeky’s and lots of time hanging by the pool. 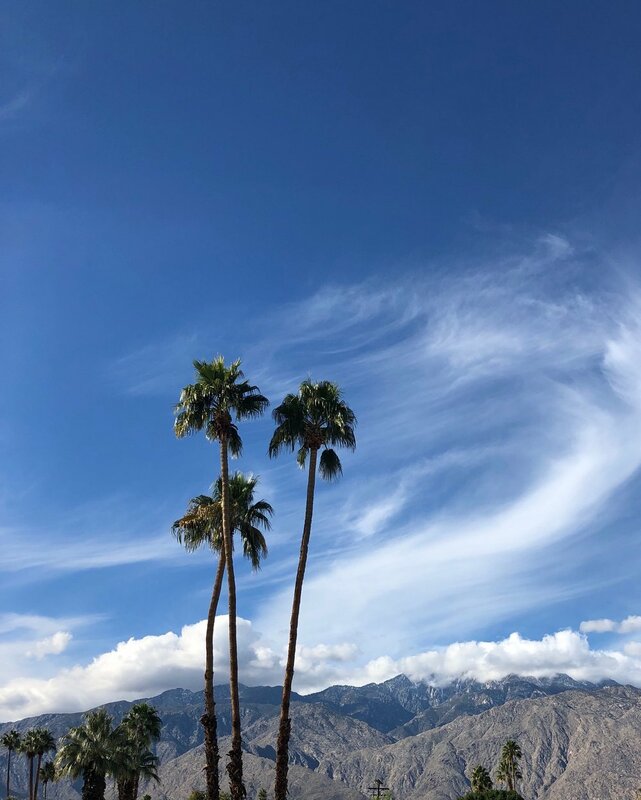 Check out all my recommendations from past trips in my Palm Springs Travel Guide. Marin County is one of those magical places that seems more beautiful every time you visit. Lucky for us, living in San Francisco has given us the opportunity to explore the area many times over the past few years. In need of a quick weekend away in November, we booked an Airbnb in Dillon Beach on a whim. We had never been to Dillon Beach before and hadn’t even heard of it, but most of our other favorite places in the surrounding areas (Inverness, Point Reyes, Tomales) didn’t have much availability left for the weekend. Dillon Beach is a super small community a few miles off Highway 1, so seems to have remained a bit of secret. I’m so glad we ended up here - our Airbnb was cozy, the small beachside town was a beautiful, sleepy spot to escape for a few days and enjoy time with our family. A good reminder to always be open to exploring new places! Pack… Comfy clothes for lounging and sneakers to walk on the beach. If you’re a surfer (I wish I was! ), bring your board and wetsuit. The beach is protected here (right at the mouth of Tomales Bay) which makes for gentle waves. Eat… Dillon Beach Coastal Kitchen is now open for lunch & dinner (and looks delicious), but otherwise there aren’t other food options. Wish we had brought our own food to make in the well-stocked kitchen (and on the grill!). The Tomales Bakery is about a 10 minute drive and was a good stop for breakfast pastries. And The Marshall Store is always my favorite and worth the drive. We just returned from an idyllic few days spent on the North Shore of Oahu, the third year in a row that we've made this trip. While I always love traveling somewhere new, returning to the same place again and again has lots of benefits as well. You know what to expect, what to pack and have a good idea of what you want to do, so there's less planning and more time to just relax. This time we brought our 3 month old baby - his first flight and first vacation (!) - which made returning to a place we know all the more appealing. We fell into an easy routine of early mornings watching the sunrise, lazy days on the beach and afternoons spent reading (or napping) during tropical rainstorms. We indulged in fresh ahi and yummy pad thai from food trucks and slept better than we have in months. If you are planning a trip to Hawaii, I highly recommend checking out Oahu for a local feel of the islands.